Green and abundant greetings to you all. The feast of the first harvest is upon us. The hay fields are cut. The grain is threshed. The first bread is baked. The grapes are ripe. The berries are flush upon the brambles. The bear is fat and happy and so are we. Are you starting to feel the pressure of the gathering dark? The pressure to harvest one more jar of yarrow to tincture before all the blossoms brown up. The desire to get one more jar of St. J's oil brewing from the last of her flowers. The struggle to find more storage space for the remedies already made. The wish for a bigger drying room as you eye the mullein still to be hung, the comfrey still to dry, the lavender, the mint, the green, the green, the green! Let the pressure be a hug, a reassuring hug. Relax into the pressure of gathering and storing for the coming days of dark. Trust yourself, trust nature. You will have what you need. You will be grateful for what you have. Allow yourself to be delighted with the work you need and want to do. Let your joy bubble up and overflow. Sure, life is hard, harsh, painful, unfair, and not as we envision it. It has always seemed to me that the best thing to do in the face of that reality is to wring as much pleasure as I can from whatever I am doing. I simply do not allow myself to do any task, large or small, with resentment. If I cannot find the pleasure in the work, then why am I doing it? If I must do it, then enjoying it is the best antidote. Simple rituals help us remember the joy, and the sacredness, of every moment. I light a pink candle every evening as an offering to the healing of all, especially those I have been in contact with that day. That small ritual brings real joy to me and allows me to fall asleep quickly and deeply. Do you have a ritual to end the day and empty your mind? Burning a bit of sweet grass is another favorite way to end the day. Ummm. 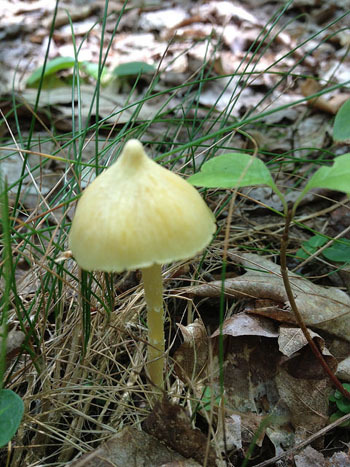 The weather has been perfect for the mushrooms to fruit: cool nights, hot days, and lots of rain. I am blessed with many sorts of delicious chanterelles. Here are three of my favorites. 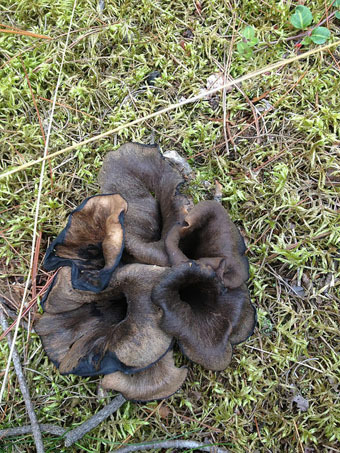 The "horn of death" is not easy to spot in the leaf litter, but once you spy one, you will surely see more. The color ranges from deep black to fallen leaf brown. The ones in the first photo are growing so closely together that they look like a mushroom rose. I pick them carefully, leaving several large ones (grandmothers) to sporulate (reproduce). I break off the dirt at the base of those I pick and rush home with them to saute them in generous amounts of organic pasture butter. 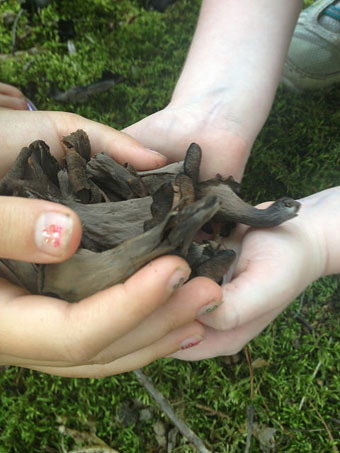 Two little girls lend their hands to carry our finds home. Such a heavenly taste!! 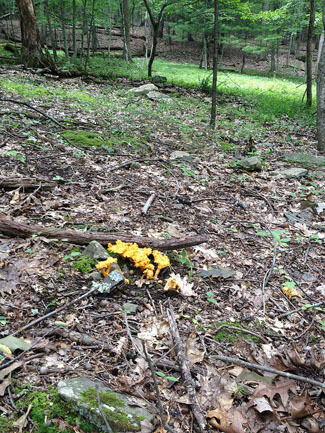 These big, meaty chanterelles are easy to spot. They lie like shards of sunlight on the forest floor. 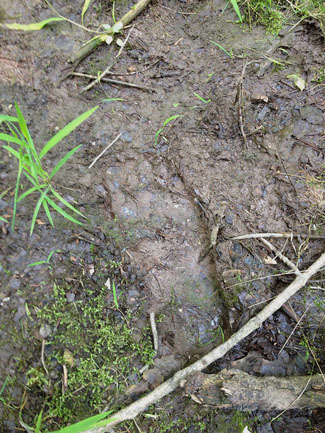 They inhabit forests throughout the temperate zone and are beloved by all, for they are easy to identify and delicious. 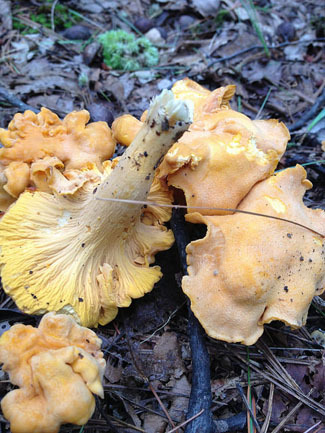 Notice that the chanterelles do not have gills, like most mushrooms, but folds. Also notice that they are vase shaped, rather than umbrella-like. In German golden chanterelles are pfifferling, a name that always makes me smile. Perhaps I will name a goat after them. A favorite way to prepare these mushrooms is to pull them apart from top to bottom into shreds and then slowly simmer the pulled apart 'shrooms in full-fat milk or cream. 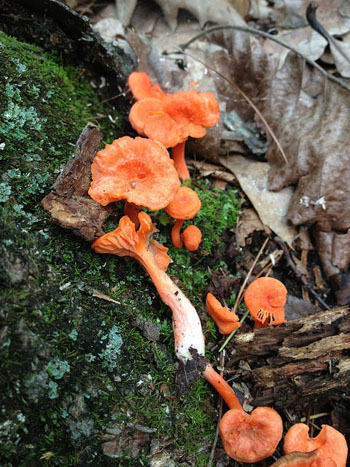 My books say these little, bright orange chanterelles are edible, but I don't eat them. First of all, most things in nature that are brightly colored are not really safe to consume. Not that I mistrust the books, but more I trust nature to show me clearly when I need to beware. 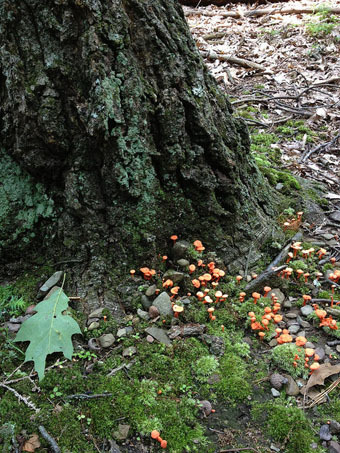 Secondly, these mushrooms are very, very small and I do not think the effort of harvesting would be repaid with more than a bite or two. And last, and perhaps most important of all, would the fairies ever forgive me if I consumed their favorite playground under the oak?!! I don't know the name of this little delight, but I am certain that the fairies do. Perhaps if I sleep with my ear to the ground, they will whisper it to me in my dreams. Clavulinas are edible and taste mild. Ramarias are poisonous and taste bitter. 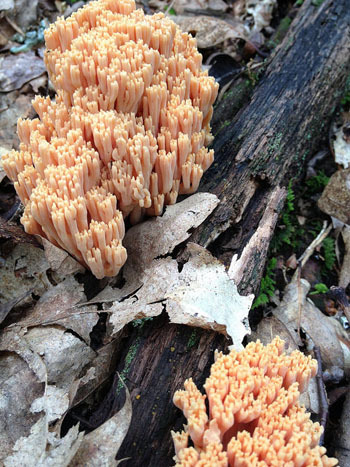 Since there are plenty of delicious mushrooms to eat that I know for sure are edible, I don't mess with any of the many coral fungi that grow in my woods. 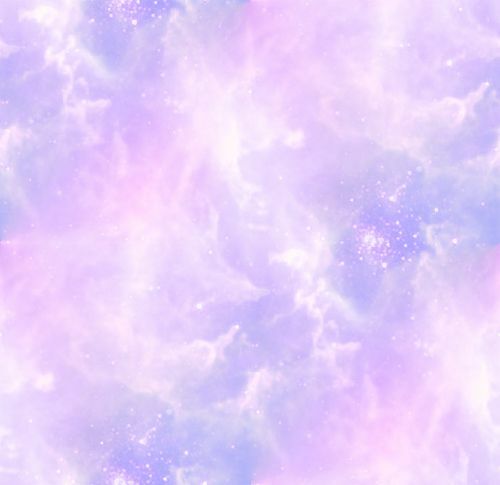 They sure are pretty though. So I feast my eyes instead of my gullet.